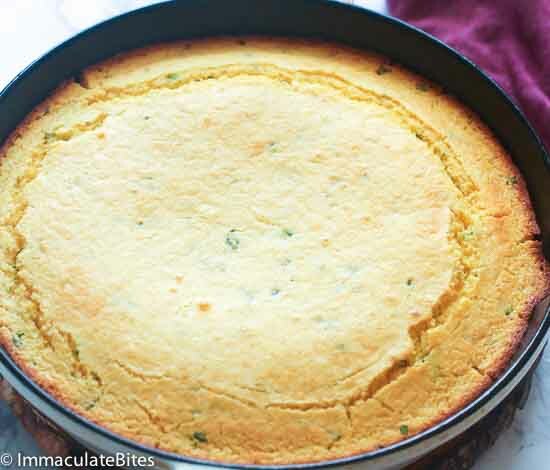 Skillet Cornbread – super moist, buttery cornbread with a perfect crumb and crispy edges. It has the right balance of sweet and tang then baked to perfection in a skillet. A great accompaniment to any fried dishes or soups and stews. It’s even great as snacks, too! 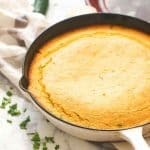 As some of you would have known, skillet cornbread is the *PERFECT* easy baked side to your favorite winter stews and soups. And I might have been a little early for winter. But guess what? 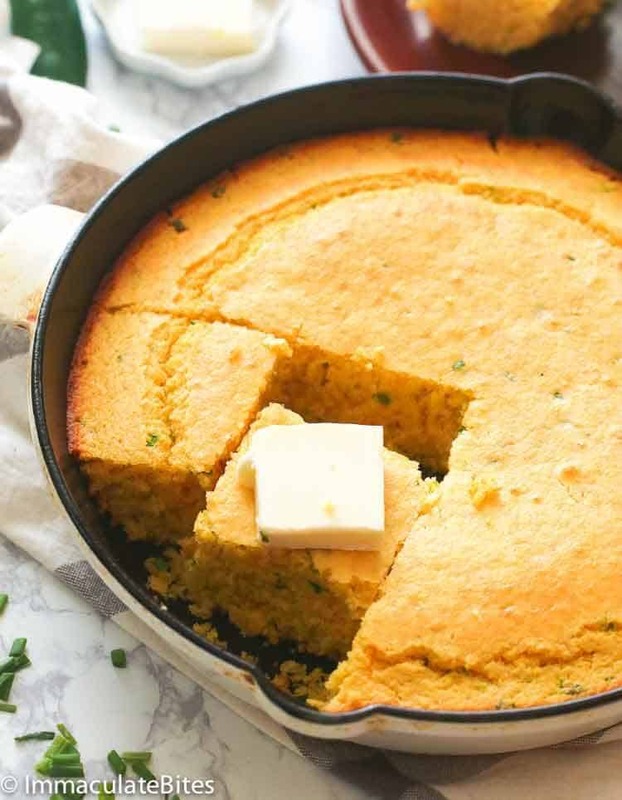 Skillet cornbread are also a crowd-favorite during summer. Heck, yes!! 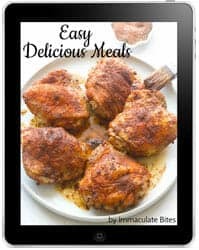 How can you pass up those crispy edges and soft and moist center with a beautiful crumb that melts in your mouth. Thanks to the added buttermilk, it’s acidity reacts with the baking soda resulting to a moist and soft crumb that is almost cake-like. It’s a magical ingredient if you want a great texture to this corny treat. And the flavor? ?…Spot on! 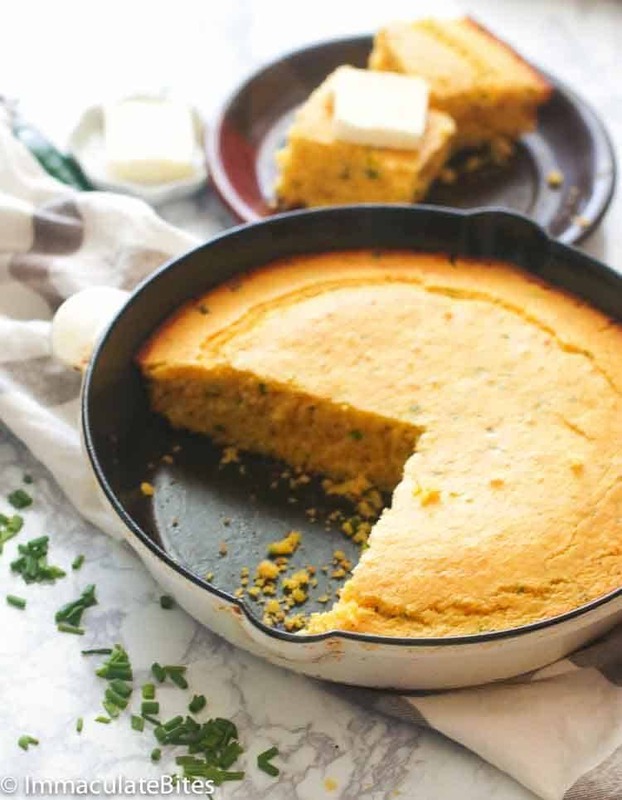 That hint of tangy flavor right there from the buttermilk complements well with the sweetness of this cornbread. We love it sweet! Annd the jalapenos pepper adds a slight kick to it . Leave it out if you prefer. You could just eat it slice after slice and forever forget about the main dish! If you don’t have buttermilk at home, you can always make a DIY version. To make your own buttermilk (or soured milk), add 1-2 tablespoons of vinegar OR lemon juice to a room temperature regular milk (whole, skim, 1% or 2%) to make a total of 1 cup. Stir it and let it stand for 5 minutes before adding it to the cornbread mixture. 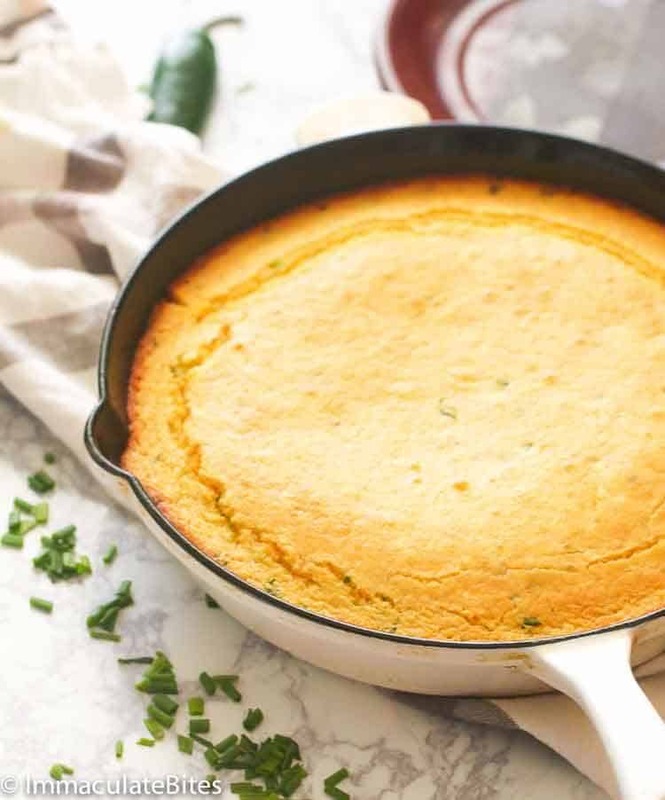 You can even let your imagination run wild and add something into this easy skillet cornbread. But my perfect add-on would perhaps be corn kernels. Oh-la-la! Corny crumby sweet cornbread with real corn in each bite. A big YES! Want a little spice to it? Follow the add-ons on this fun version of South African Cornbread aka Mealie Bread or some tropical twist like these Corn Muffins HERE. You won’t regret it! Just don’t skip the butter, buttermilk and skillet and you’re good to go. 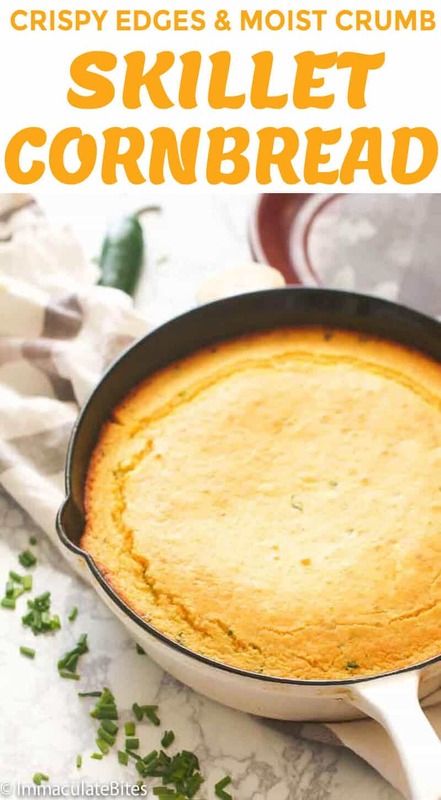 You’ll be eating for days with this highly indulgent easy Skillet Cornbread topped with either butter or jam or as it is. You can also use cast iron instead of regular skillet. 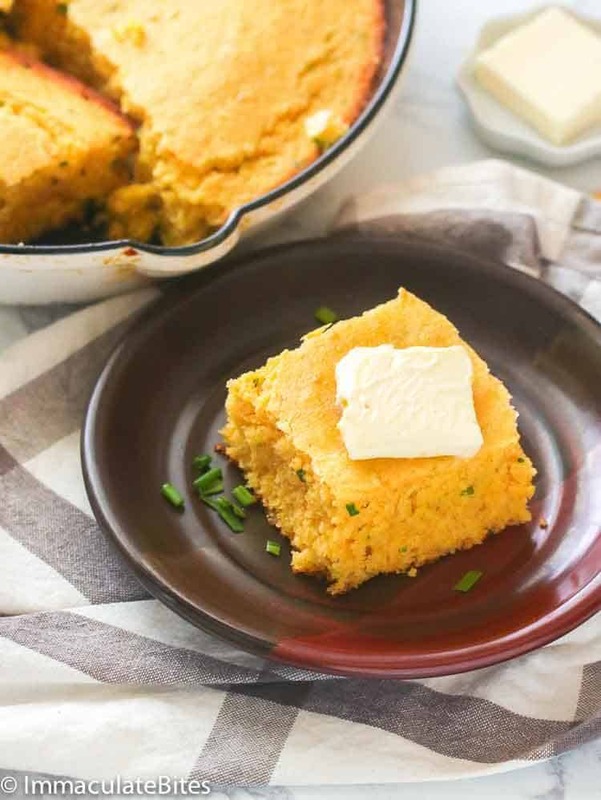 You can store baked cornbread in the freezer for up to 3 months. Just thaw it overnight in the fridge before you heat it up in the microwave oven. If you want to add frozen corn kernels, thaw it and drain well. For canned corns, drain it well, too. You may substitute the chives with green onions, or and other herb of choice. 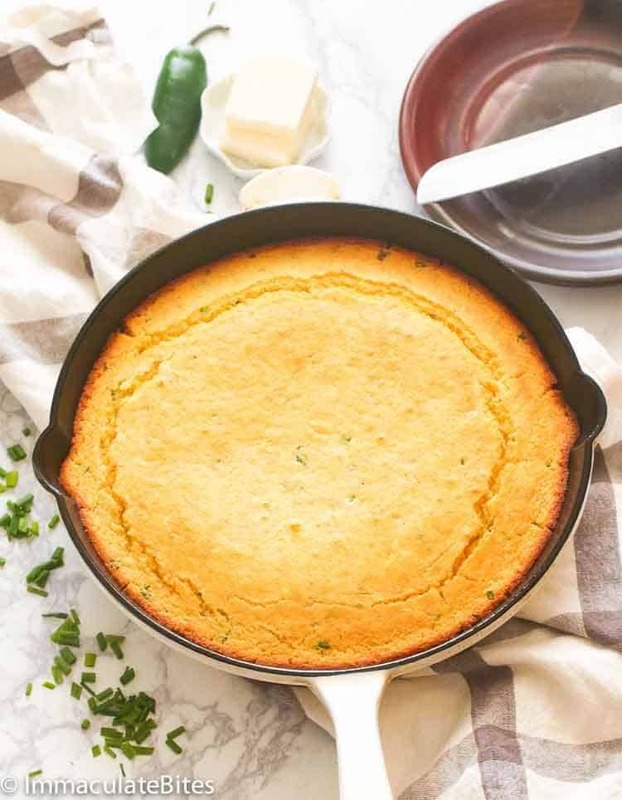 Skillet Cornbread - super moist, buttery cornbread with a perfect crumb and crispy edges. It has the right balance of sweet and tang then baked to perfection in a skillet. A great accompaniment to any fried dishes or soups and stews. It's even great as snacks, too! Preheat the oven to 350 degrees F. Spray a 10 inch skillet and set aside. 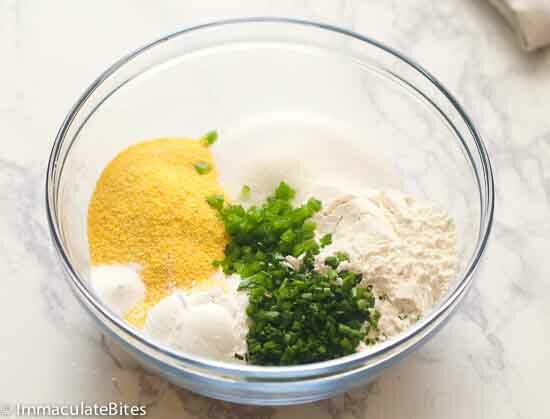 In a medium bowl, whisk together the flour, cornmeal, baking soda and powder, sugar, chives, jalapeno and salt. 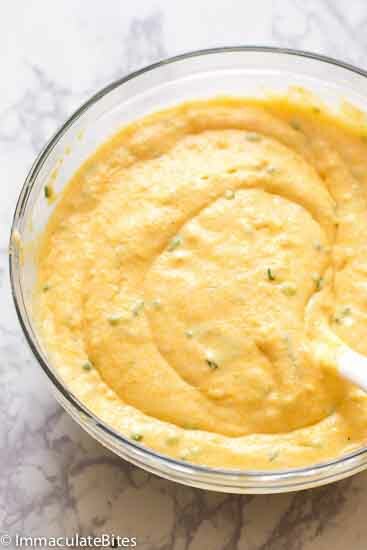 Whisk in milk, buttermilk and lightly beaten eggs until well combined. 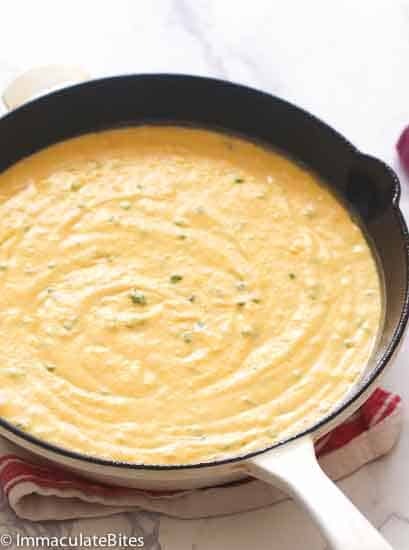 Pour batter into prepared skillet. Bake for about 18 -20 minutes or until light golden brown and toothpick inserted in center comes out clean. Preheat the oven to 350 degrees F. Spray a 10 inch skillet and set aside. 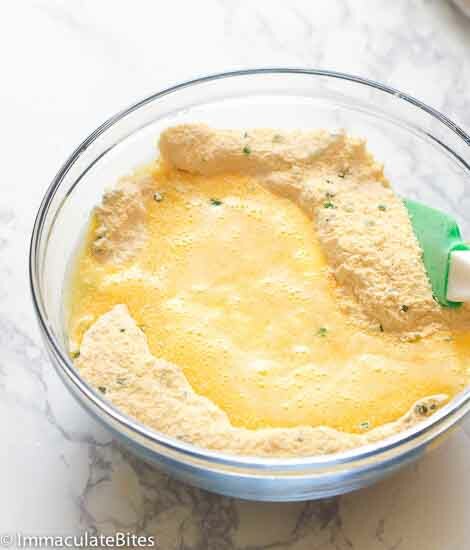 In a medium bowl, whisk together the flour, cornmeal, baking powder, sugar, salt and chives. Whisk in milk, buttermilk and lightly beaten eggs until well combined. Then, add melted butter. Bake for about 18 -20 minutes or until light golden brown and toothpick inserted in center comes out clean. I appreciate your blog so much, and your recipes are wonderful Imma! Cheddar cheese would be a great additional along with the jalapenos too!